The purpose of this booklet is to describe the basic process of money creation in a “fractional reserve” banking system. The approach taken illustrates the changes in bank balance sheets that occur when deposits in banks change as a result of monetary action by the Federal Reserve System —— the central bank of the United States. The relationships shown are based on simplifying assumptions. For the sake of simplicity, the relationships are shown as if they were mechanical, but they are not, as is described later in the booklet. Thus, they should not be interpreted to imply a close and predictable relationship between a specific central bank transaction and the quantity of money. The introductory pages contain a brief general description of the characteristics of money and how the U.S. money system works. The illustrations in the following two sections describe two processes: first, how bank deposits expand or contract in response to changes in the amount of reserves supplied by the central bank; and second, how those reserves are affected by both Federal Reserve actions and other factors. 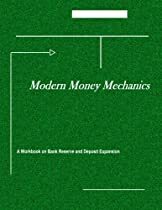 A final section deals with some of the elements that modify, at least in the short run, the simple mechanical relationship between bank reserves and deposit money.